How do airplanes fly in the sky, ships move in the water and rockets take off into the space? These movements all have one thing in common — thrust. 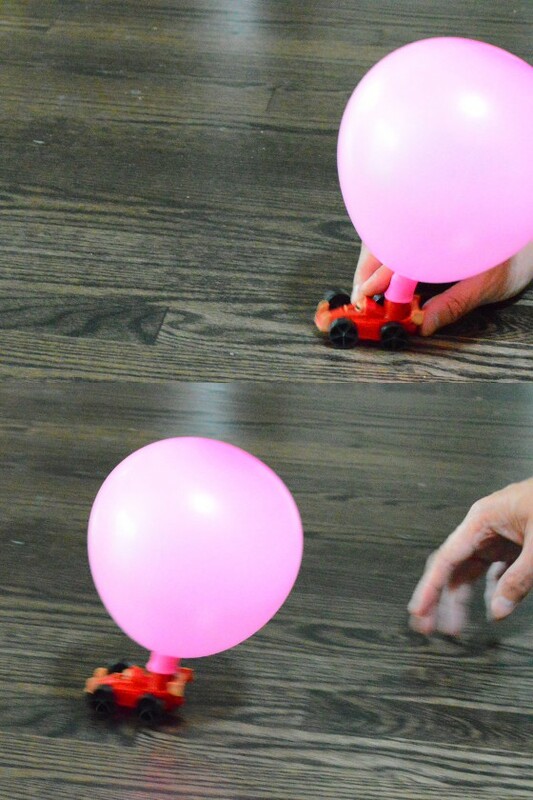 Here is a fun science experiment to show how propulsion creates thrust to move vehicles. 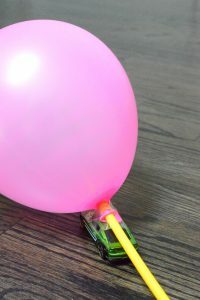 Insert one end of the straw into the balloon and fasten it using a rubber band. Secure the balloon onto the toy car. The balloon’s opening should point towards the back of the car. 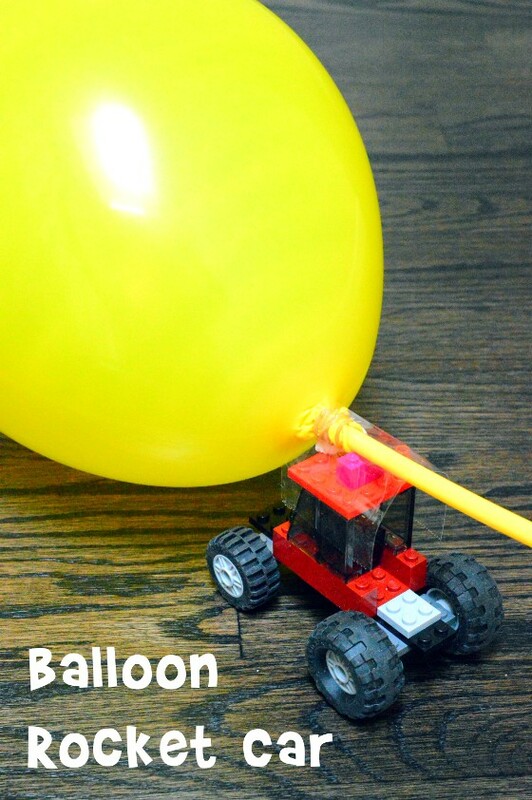 Blow into the straw to inflate the balloon and hold the straw tightly when you’re done to not let the air escape. Put it on a table or the floor and then let go. If your car doesn’t move or moves very slowly, try a smaller, lighter car. 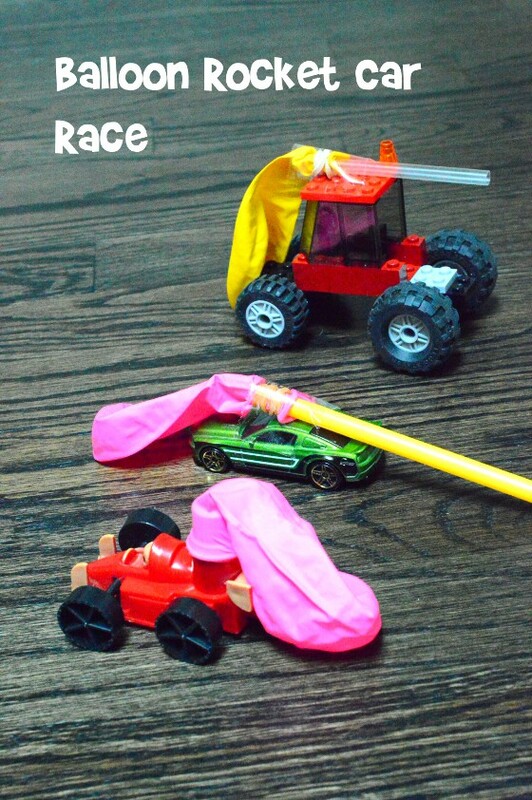 Experiment with cars of different sizes and weights and see which one goes the fastest. 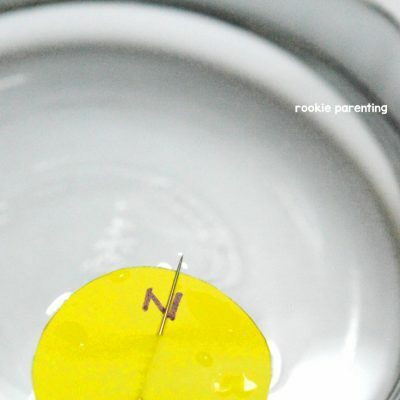 Experiment with balloon nozzles pointing at different directions and see what happens. 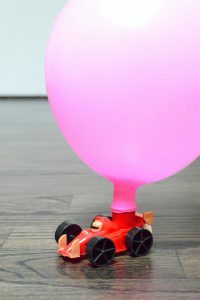 When the balloon is blown up, the air inside is pushing on the skin to keep it inflated. Covering the straw opening keeps this high pressure air trapped. Once the straw nozzle is uncovered, the balloon’s stretched skin pushes the air out and creates a thrust. This thrust force propels and makes the car accelerate forward. And you will find that the lighter the car, the faster it goes. This demonstrates Newton’s Third Law of action and reaction. When there is action, i.e. 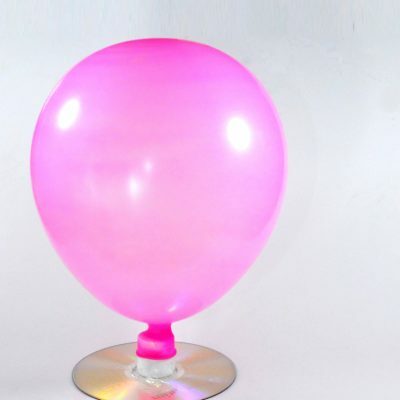 the balloon skin compresses the air pushing it to escape backward, there is reaction, i.e. the resulting thrust pushes the balloon forward. Similarly, in an airplane, the turbine engines use the surrounding air to generate a thrust which propels the airplane forward. 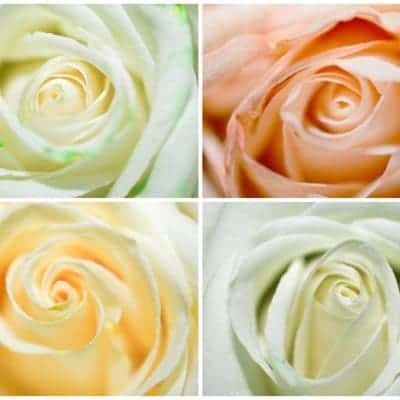 The surrounding air is the working fluid in this propulsion system. In a ship, the turbine engines use water as the working fluid. In a rocket, fuel and oxygen are mixed and exploded in a combustion chamber to product hot exhaust. This hot exhaust is the thrust that propels the rocket. Unlike airplanes, a rocket doesn’t use the surrounding air as the working fluid because there is no air in space. All of these vehicles move in accordance with Newton’s Third Law.